attention to another task. I had a huge stack of old issues of Washington Trails magazines, Signpost magazines (precursors of Washington Trails), Pack ‘n Paddle magazines, and a few books published by Signpost. I contacted Washington Trails and they said they would be delighted to receive my trails memorabilia to fill in the blank spaces in their own collection. 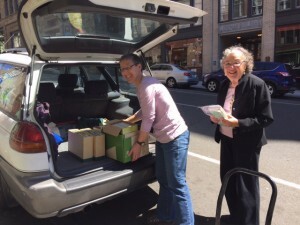 Quickly, before they could change their mind, I delivered two big boxes downtown. Then I switched my attention to a big box of memorabilia. On top of the box were two scrapbooks from my senior year in high school. Much of the material concerned my social life, invitations to and programs from events at school and in the Jewish community. I was surprised by the number of dried corsages in the scrapbooks, the dried ferns leaking out; it was an expense of dating at that time that boys today don’t have to contend with. The Jewish kids had a social life that was separate but in addition to the school’s social life. It was facilitated by the location of Omaha Central High, which most of the Jewish kids attended. Central was right across the street from the Jewish Community Center, and most of us headed straight for the “J” when school let out. Although the term “milling” had not yet been invented, we milled around the lobby getting to know each other and making plans. 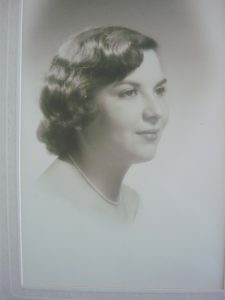 Some of the community organizations that had offices in the building complained about the noise and tumult of all those kids, but many marriages were made not in heaven but in the crowded lobby of the “J.” I contacted the Nebraska Jewish Historical Society, and they agreed to accept the scrapbooks. I removed the most personal items and sent them off, giving them permission to destroy any items that were not of historical value and all the dried corsages. Under the scrapbooks I found a treasure trove–all the letters I had received from Don when I was in college in Massachusetts and he was in Nebraska. I read through them all. He hated fraternity life, the hazing and pledging. He also described all the dating he was doing, and complained that I was not telling him anything about the boys I was dating. He told me, more than once, that he had put his arms around a girl, held her close, and whispered in her ear, “Goldie.” I decided to burn all the letters. I do not want to share more than this with the next generations. Under the letters, more treasures. 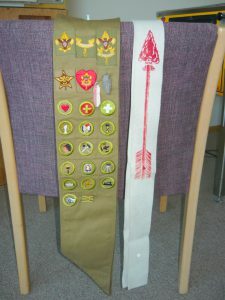 A boy scout merit badge sash and order of the arrow. I thought these were son Jeff’s, but they turned out to be Don’s. If he had aged out of scouts at age 18, the sash would be 65 years old. Some of the badges are so old that we can’t identify them; they no longer show up on the boy scout web pages. With all those badges, Don never became an eagle scout because he never could earn the swimming merit badge. I remember his scout group that he continued to be part of even in high school. They held parties in the sea scout ship, among other places, very tame, sedate parties with his scout master and his girl friend as chaperones. So far as I know, I was the only girl that Don ever invited to one of those parties. it, I remember having the photo taken in Northampton. I must have been 19 or 20 years old and had longer hair. I fell in love with that resurrected picture. I’ve never looked so good since. I have it on my desk, and I don’t know what to do with it, except that I’m letting my hair grow long again. This entry was posted in De-Cluttering, Family, Flowers, On Aging, Uncategorized and tagged Washington Trails, Writing. Bookmark the permalink.